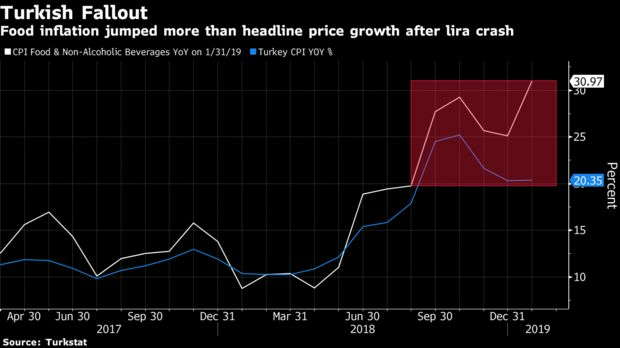 A run-up in Turkey’s food costs halted a broader deceleration in price growth, complicating the start of monetary easing. Food and non-alcoholic beverage prices surged an annual 31 percent in January, the most since at least 2004, sending consumer inflation to 20.4 percent, according to data released by Turkstat on Monday. That exceeded the median forecast in a Bloomberg survey of economists, which was for the headline gauge to stay unchanged at 20.3 percent. The first pickup in inflation since October all but removes the possibility of a cut in interest rates next month. 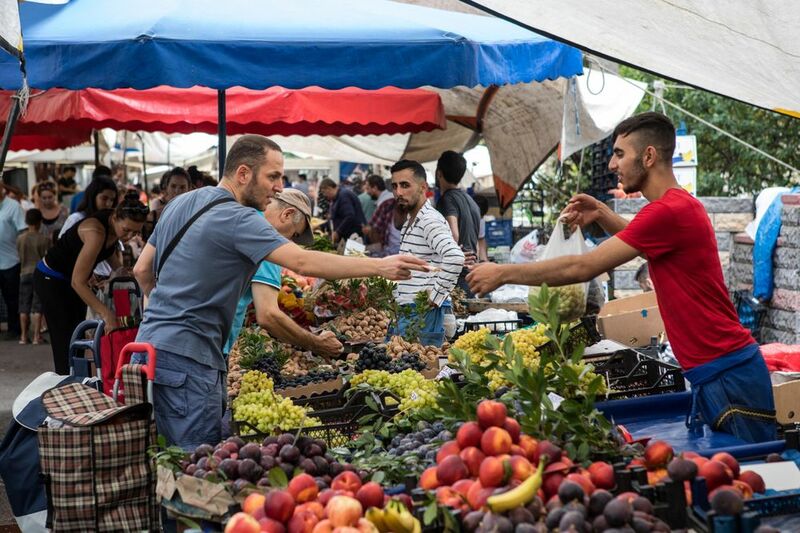 Shortages caused by flash floods in Antalya, a hub for greenhouse farming, are making matters worse after the rapid depreciation of the lira in August raised the cost of food imports and transportation. “We expect the impact of Antalya floods on food inflation to continue in February,” said Muammer Komurcuoglu, an Istanbul-based economist at IS Investment, whose base-case scenario is for price growth to hover around 20 percent in the first half before slowing to 11 percent in the third quarter and accelerating again toward the end of the year. The first rate cut could come in June or July, Komurcuoglu said in an emailed report. 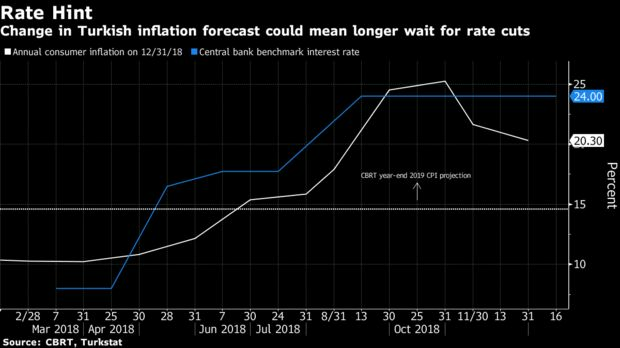 Turkey’s central bank might be even less willing to cut interest rates after already signaling it remains reluctant to adjust its crisis-level monetary settings. Without the spike in food costs, consumer inflation would have eased by about 1.3 percentage point in January, according to Bloomberg Economics, which projects April as the earliest possible date for a rate cut. Gains in the cost of food are offsetting reductions in utility prices. Annual food inflation has been near 20 percent or higher since June. Turkstat published tweaks to its inflation basket, increasing the share of food and non-alcoholic beverages to 23.29 percent from 23.03 percent. The weightings of transportation and alcoholic beverages and tobacco were cut to 16.78 percent and 4.23 percent, respectively, from 17.47 percent and 5.14 percent. Adjusted for current inflation, Turkey’s real rate is near 4 percent — higher than the level of around 2 percent in emerging markets as a whole — and will average about 5 percent in the rest of 2019, according to Morgan Stanley.